Is it breakfast? Is it dinner? Maybe lunch? How about all three?!! 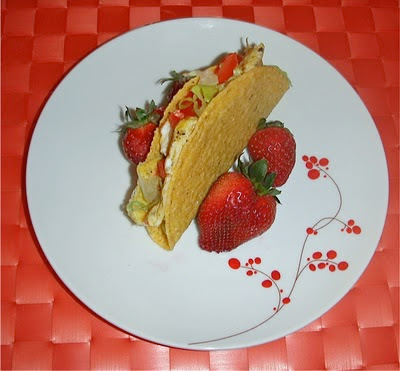 :) This fun recipe can be changed up with anything you desire in a taco. Substitute any veggies you like, top with a pinch of cheese and a bit of salsa; and that's one terrific taco! In a small bowl, beat eggs and milk together. Add pepper, garlic powder, ripe olives, and chopped onion. Heat large skillet sprayed with Pam cooking spray. Add egg mixture to pan. As mixture begins to set at bottom and side, gently lift cooked portions with spatula so that thin, uncooked portions can flow to bottom. Cook until eggs are thickened throughout. Take a taco shell and add in a little bit of lettuce, some of the egg mixture, a pinch of shredded cheese, and top it off with a little salsa. Enjoy! If you'd like a printer-friendly version of this recipe, Click Here.